You can see more of these 'vintage' garden beauties here, the 'rhubarb shot' is a real winner. 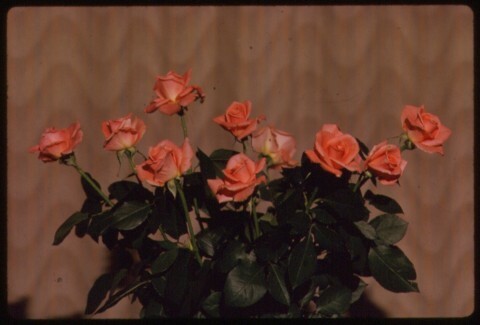 I just realised I'm posting a picture of roses on Valentines day! It often seems that I have little in common with the rest of my family in the way of hobbies/profession, certainly none of my immediate family could be regarded as being mad about gardening. 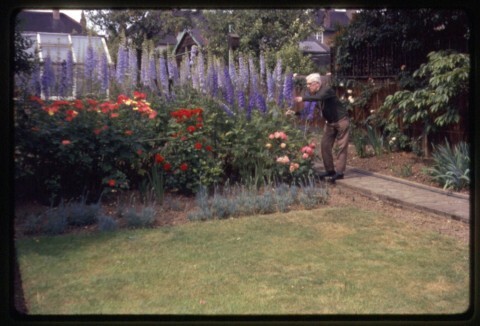 A recent trawl through our loft though has thrown up boxes of old slides taken by my Great Great Uncle including images of my Great Grandparents in their garden - which I can vaguely remember. I really love some of the images - the layout of the garden is SO old fashioned and the staked delphiniums would put most contemporary allotment holders to shame. Yet some of the images of individual plants and particularly cut flowers and vegetables could have been taken by me, at Abbey Gardens or on my allotment. The vases I often use for cut flowers are in fact from my grandmother and she may well have inherited them from my Great Grand Parents ... there's something nice about fresh, fragile cut flowers forging such an immediate and powerful link to people from your past. The regular Garden Club sessions have now finished until next spring but if it's a nice day you can normally find some regulars at the garden on Saturdays if you want to visit. On Saturday 21st January there will certainly be some of the Friends group there for the second of their informal Winter gardening sessions, from 10am – 2pm. We have spent a lot of time trying to find someone local interested in taking up the role of secretary for the group so if you're reading this and think it might be for you do get in touch. produce are available for donations. 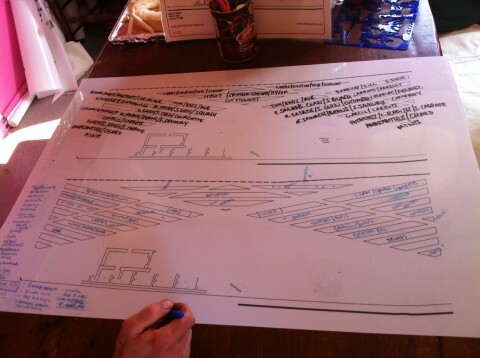 Hamish and I spent a happy couple of hours yesterday afternoon working on the planting plan for next year - at season 4 there's even some crops which have done a 'full rotation'. I love doing the planting plan - it's such a challenge to balance your 'wish list' of plants with 'what will work where' and 'what has grown where before'! New things we want to try next year include sweet potatoes, purple and yellow beans, dark mangetout and of course some new flower and vegetable combinations. 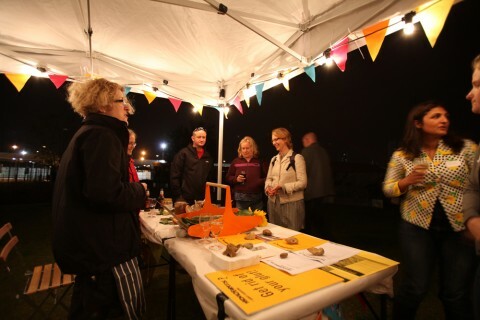 It's been super busy at Abbey Gardens - we've had our Green East networking night (you can see some nice pictures of this here) including the very popular 'Get Rid of your Glut' table of (largely pickled) products! This years Harvest Festival went with a swing, a mid event downpour rather adding to the good natured chaos. 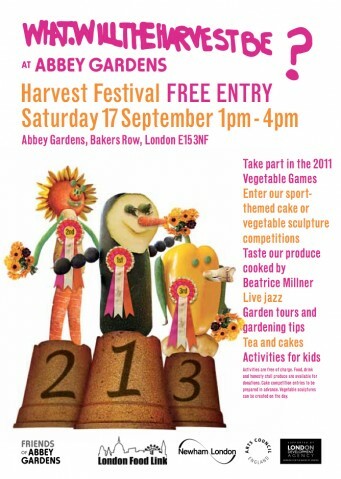 It's that time of year again and the Harvest Festival is looming! 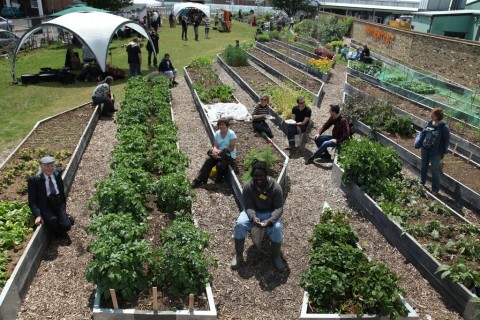 • Kids’ activities related to the garden Activities are free of charge. 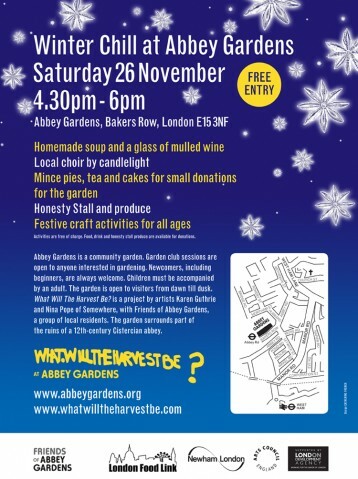 Food, drink and honesty stall produce are available for donations. Cake competition entries to be prepared in advance. Vegetable sculptures can also be created on the day. Yes we have achieved what some see as the ultimate gardening accolade - next year Abbey Gardens will join the NGS (National Garden Scheme) and appear in the all important yellow book. Put it in your diary now - Saturday the 8th of September! It's all go at Somewhere this week and not just in our own studio/homes ... editor Alice Powell has managed to tackle the mini mountain of video documentation I recorded during the first year of building Abbey Gardens and has made this very nice short film. It will feature in our last Floating Cinema tours in September 'The Green East' (which will both end at Abbey Gardens) plus I will be using it for a talk at the View Tube cafe tonight (!) but here for you our WWTHB? regulars to enjoy now! 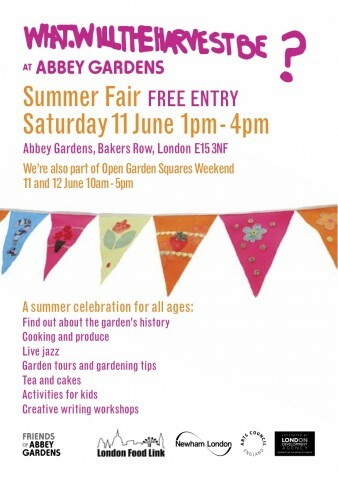 For both our Summer Fair FREE ENTRY Saturday 11 June 1pm - 4pm AND Open Garden Squares. A summer celebration for all ages: Find out about the garden’s history, cooking and produce, live jazz, garden tours and gardening tips, tea and cakes, activities for kids & creative writing workshops. • Ollie Redfern will run his fantastic creative writing workshops at 2pm and 3pm.